Some weeks ago I was in Joann Fabrics and passed by the display advertising upcoming classes. 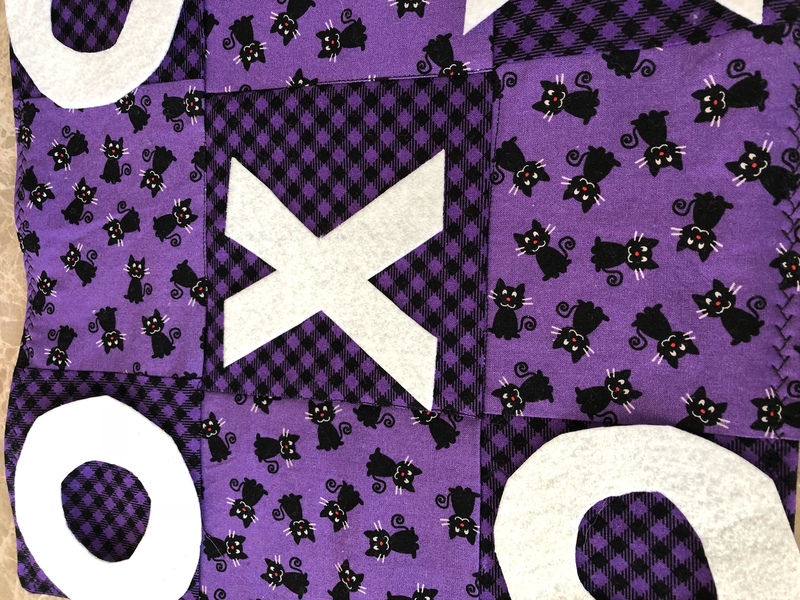 A cute quilted Tic Tac Toe board caught my eye, and as you can guess, I went home and created one! This project was pretty simple, and inexpensive. 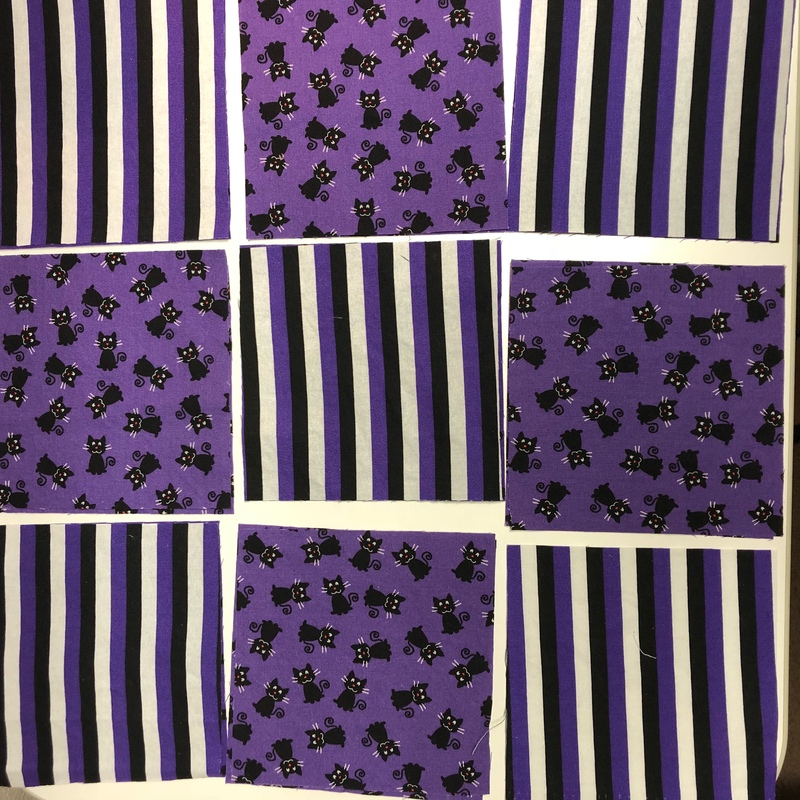 I used fabric from my stash, using purple fabric designs and a cute black cat print as well. 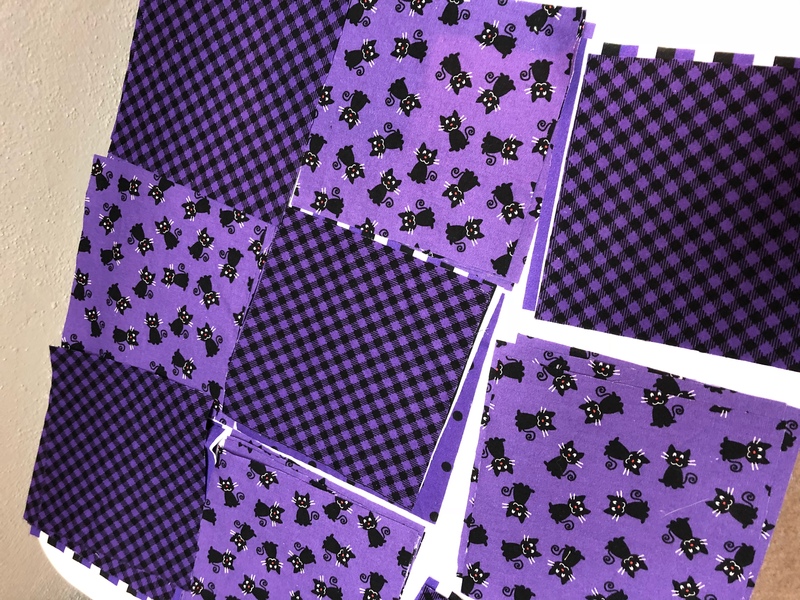 I cut the fabric into 5 inch blocks, using 2 coordinating prints for each board. 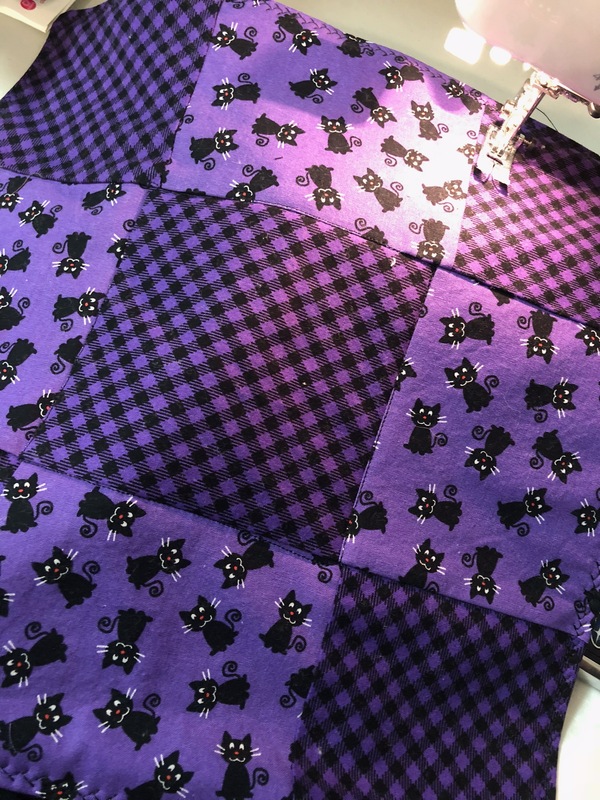 Then I pieced each board, row by row, and then stitched the rows together. Then I laid the backing, right sides facing, on top of the pieced game board. I stitched all around, leaving about 3 inches open for turning. Once that was completed, I turned the game board right side out and pressed it all just right. Lastly, I top stitched along the rows and around the board, closing the opening. For the X and O pieces I asked my 15 year old for help. 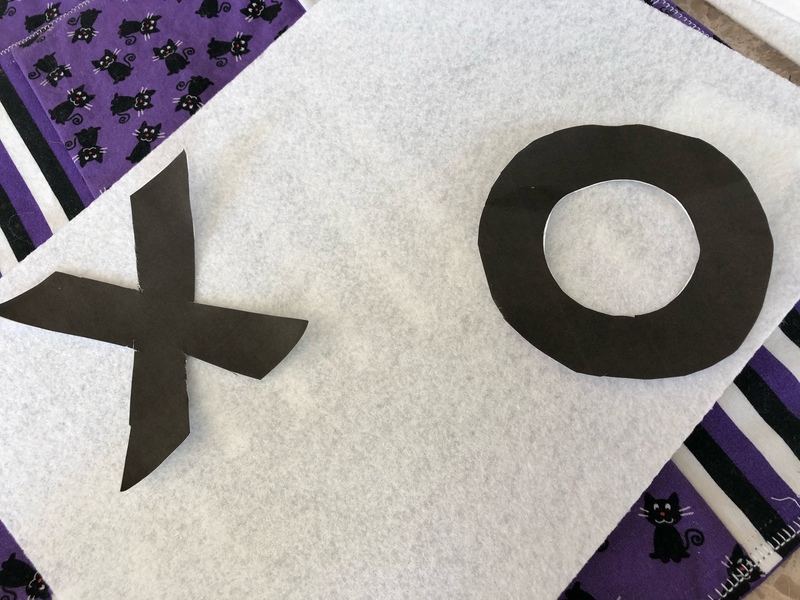 She printed an X and an O template for me right out of Word. I then used the templates to cut out 5 X and 5 O pieces for each game board. I used stiff sparkly white felt squares for the X and O pieces, that I purchased from Joann Fabrics. These game boards look so cute, and I hope that my grandkids and their parents have a little fun connecting over this tactile version of Tic Tac Toe! Here is the set that I have placed on a table in our living room. A little “invitation to play” as we relax after full and crazy days. 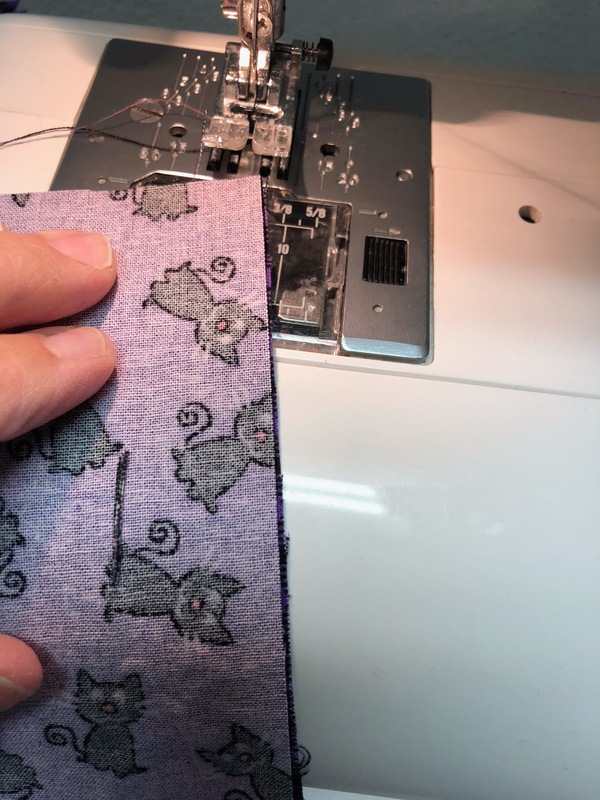 Using many different fabric combinations, you could make these as party favors, waiting room gifts, and of course little surprises in the mail for kids you love. 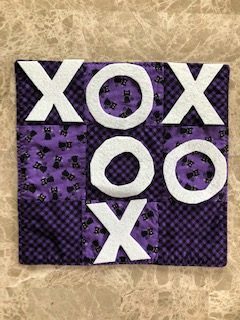 A cute quilted Tic Tac Toe board you can make in an afternoon. Make in any combination of colors, for an everyday or holiday addition to family fun. This idea was inspired by Joann Fabrics, but the details here are all my own. Enjoy!